MARTIN ROGERS leads the tributes to one of the greatest, a track giant always spoken about in reverential terms by his peers and supporters alike. The double World Champion and Wimbledon legend passed away in his native Christchurch, New Zealand on August 18, 2018, aged 85. 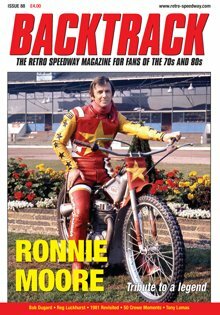 Martin writes: "Statistics can be twisted and turned to prove or disprove anything, armchair pundits can believe whatever they want, but if you take the word of Ivan Mauger and Briggo, who won 10 individual world titles between them, there was nobody like Ronnie." Bobby Dugard, the man who kept Eastbourne Eagles flying higher and longer than anyone, died, aged 76, on August 5, 2018. Former Eastbourne co-promoter and team manager RUSSELL LANNING pays tribute to his old mentor and inspiration and looks back on four meetings that encapsulate his memories of Bob. Readers also express their views on the irreplaceable Arlington legend. Russ writes: "Underneath that hard-as-nails exterior was the softest, most gentle generous guy who was happiest sitting in the background watching ‘his’ team take the plaudits. His passion to create successful sides also gelled with his love of producing a track surface that the majority of the current British circuit curators could only dream about. He knew every inch of every track he worked on." Looking back on another momentous year with ANDREW SKEELS, who recalls the sudden decline in England's fortunes and the rise of the Danes, dominant Bruce Penhall in the last Wembley final, first championships for Cradley Heath and Middlesbrough, and the closure of Hull . . .
PHIL CHARD talks to a seasoned performer with Wimbledon, West Ham and Canterbury who was a hit on and off track. Reg reflects on his successful time as a recording artist, signing tunes such as Your Cheatin' Heart and In The Misty Moonlight. “I said: ‘if you take a record to every speedway track in the country and say I’ll sign the disc for everyone who buys it at the speedway track, that’ll do for a start', and it did go down well. “We sold 11,000 records in a week. Decca couldn’t believe it. They hadn’t heard of anyone like me making a record for the first time selling 11,000 that fast before. “We got 6d a record (37 pence today) and the Decca sales director said: ‘Would you like to record another one?’"
'Lucky' also talks about building his own speedway practice track in his native Kent, shares his thoughts on the racing careers of his sons Jamie and Jeremy, and why he regretted managing Canterbury. After earning international acclaim with his local club Coventry and winning the BL title with Exeter, Tony Lomas lost enthusiasm for the sport and ended up walking out on Leicester. But as he explains in the second and final part of his candid interview with TONY McDONALD, a spell back in the second tier with Stoke rekindled the flame before safety concerns convinced him to retire. Tony also explains the 'secrets' of his lightning gating technique, the effect the death of former team-mate Kevin Holden had on the Lomas family, how and why the Midland Riders' Championship was "fixed". Tony says: "I went to one or two of the other riders and told them: 'It's a death-trap and I'm not going to ride but if you choose to do so, it's up to you'. They said: 'Oh yeah, we'll back you up' but, of course, as it got closer to the start of the meeting, they were all putting their leathers on. "I had my leathers on too but then I thought, 'do I bloody well need this?'. I said to Kevin Ellery, my mechanic – he was a bricklayer from Rugby and in the close season I worked for him as a hod carrier: 'Go and get my bikes, we're going home'. "My leathers were down around my knees when Ron Wilson came rushing into the dressing room and said: 'What the hell are you doing?' I replied: 'I'm getting changed and then going home – I'm finished'. "I was just about to drive out of the car park when I met Ivan (Mauger), who was just arriving – Exeter were on second in the meeting. I told him what had happened and that I'd had enough, and he said: 'If you feel like that, it's probably the best thing to do, otherwise you could hurt yourself'." In the last of the series, MARTIN ROGERS looks back at the impact of the bouncing Czechs who invariably delivered high thrills and spills, if not always best results. Featured riders include Antonin Kasper, Jiri Stancl, Vaclav and Jan Verner, Zdenek Kudrna, Ales Dryml and Milan Spinka. Readers also remember their favourite Czechs, with mentions for Emil Sova and the touring team that rocked Romford. DOUG NICOLSON trawled the record books for biggest wins and losses in the British League and National League years (1970-90) and figured out that Happiness Wasn't Always 40-38. TONY McDONALD talks to the prolific author, former magazine editor and publisher and, at 84, still a weekly columnist who made it his mission to preserve speedway's history. Defending himself over his controversial Ivan Mauger book, John says: "I sent a complete disk of the narrative of that book to Ivan well in advance of publication, so he had ample time to object to anything I had written. He didn’t. And I respected him even more for that. "Incidentally, I have had a good relationship with the Mauger family for many years and still do. And I regret not a single word that appears in that book and there has never been any adverse criticism of the content. There is far more positive comment favourable to Ivan than there is negative. It is a book I am intensely proud of." MARTIN NEAL catches up with the former Sheffield and Doncaster prospect whose short-lived racing career was effectively ended by a crash. Stuart says: “I once rode at Belle Vue in a bloody thunderstorm! It was tanking it down and by the time you’d got 100 yards out of the gate you couldn’t see where you were going and you had to take your goggles off. We didn’t worry about that, though – we weren’t bothered about getting our fancy leathers dirty! “You were all mates back then. If your bike broke down, before the two minutes were up there was somebody out there saying: ‘Here, take my bike’. I used to carry spare sprockets and if anyone wanted to borrow one, I used to lend them it. Now they hardly even talk to each other." Just received my copy. Looks great as usual with tributes to both Ronnie Moore and Bob Dugard. Hi, when is the next issue due? ...and mine! Interesting interview with ex-Cheetah Colin Ackroyd. Showed good potential and another who came thru' the Eastbourne Academy but found breaking into ' The Eagles' side difficult to say the least. Arlington's second halves had loads of good prospects and it was a natural way for youngsters to ply their trade competing against first team members. Always amuses me when people condemn the old second halves but how are riders able to develop without the valuable experience as was the want under the old system?